Why go with Anchor Tours? 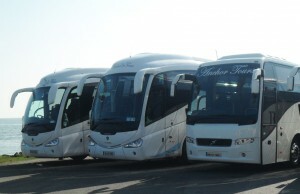 Well, because we are a nationwide coach and bus hire with a large fleet of top-quality coaches and buses, ranging from our 16 Seater Mini-Buses to our 59 Seater Scanias. We cater for all private tours around Ireland and Europe, for groups as diverse as sports teams and school tours to business people travelling to corporate events. Whatever your transportation requirements, with our flexible and friendly drivers you will find us very willing to accommodate your needs. Anchor Tours was established in 1963 by Patrick Keenan – starting with one bus taking locals and football teams to their matches. This Sunday hobby became a growing business and so when son, Seamus, took over the company in 1982 the company had grown to 5 tour buses. We have since expanded into many different transport areas, including contracts from Bus Eireann to transport school children and students to and from schools. We travel all over Ireland on educational and tourist trips, have crossed the Channel for football matches and have ferried to France on occasion. We are always interested in hearing from you, so please don’t hesitate to contact us on the numbers on the right of the page, or click here to fill out our contact form.